It’s that time again! June 17 is Free RPG Day, or “Tabletop Christmas” as I call it, a special day when gaming companies provide free role-playing product to encourage folks to try new RPGs. Game stores who take part will have the items available, and the better ones also run RPG events during the day. Which brings me to where I’ll be on FRPGD. Swing by Apt to Game on Saturday and you can join me on Table 2 for a rousing round or two of Kobolds Ate My Baby!. If you aren’t familiar with the game, you play those hungry little sociopaths and adventurer doorstops called kobolds, ordered by King Torg (ALL HAIL KING TORG!) to bring delicious food back to the caves. Babies are the preferred delicacy, but kobolds are also delicious so you’d better find something to put in the pot! If kobolds aren’t your bag, you can have a seat at Table 1 and join Mark as he introduces you to FFG’s Star Wars Roleplaying Game with an Age of Rebellion adventure. Join the Rebel alliance for a few hours and try your luck against Stormtroopers and other nasties of the Star Wars universe. Kobolds or Rebels, the choice is yours. Games begin at 1pm, and I believe the FRPGD material will be available just before that. You can book a seat at a table by stopping by the Facebook event page and leaving a comment. Otherwise, the games are first come, first served. I hope to see you there! 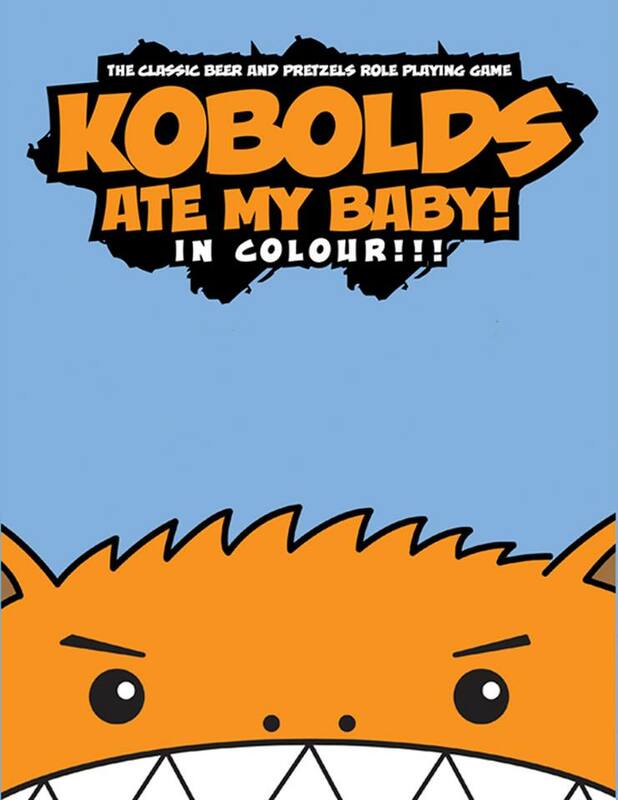 Free RPG Day Kobolds Ate My Baby! Once again I am taking part in Extra Life, raising funds for the Children’s Hospital Foundation of Alberta with Team #Knifeshoes. If you’d like to make a donation, please do so through my secure donation page. I’m really excited to be taking part again this year, and with your donations I’m hoping I’ll beat last year’s total. With the expansion of Extra Life in to the table-top realm, I’ll be heading up Team #Kinifeshoes’ board and role-playing game special teams. I’ll start the day at a local gaming convention, InrigueCon, running a table of Kobolds Ate My Baby! Then a quick run over to Team #Knifeshoes HQ (a friend’s house) to set-up in their game room for the rest of the 24 hours. I’m going to use this as an opportunity to take D&D 5th out for a spin, and run through the basic box material. Assuming that doesn’t last us the entire rest of the time, we’ll intersperse with board games to cleanse the palette. I look forward to a whole lot of fun being had (tired, tired fun), all in a great cause. Please make a donation if you can (you can donate from anywhere, by the way; it will credit you according to your country’s donation laws) of any amount. Every $5 helps, and adds up to get us closer to our goal. And if you live in Edmonton, contact me if you want to play in the D&D 5th at least part of the day. I’ll let you know what time we’ll start and where Team #Knifeshoes HQ is located. My only stipulation (if you aren’t already on Team #Knifeshoes) is that you make a donation to me. It is a fundraiser, after all. D&D Extra Life Kobolds Ate My Baby!